We've said it before but we'll say it again, one of our favorite skinny secrets is don't drink your calories! Every week we make a batch of fruit infused water because we agree, plain old ice water can get a bit boring sometimes. Today's batch is a super easy & super flavorful peach infused water. Fresh peaches would be perfect but we took a bit of help from the store and used a can of peaches. Canned peaches are just as delicious here just make sure to get them in 100% juice! Who wants the unnecessary calories from heavy, sugar loaded syrup? No thank you! To make this, simply drain off your peaches if you use canned. Then add your peaches, ice and cold water to a glass pitcher! We typically refrigerate this for about an hour to let flavors marry but feel free to dive right in if it looks too good to wait :) Hope you enjoy this refreshing treat! And if you're looking to grow you business & gain traiffic to your website this Summer, check out our advertise page as we just launched some new sponsorship opportunities! With 43,018 page views last month & 8,800+ followers, we would LOVE to help promote your site! Oh yum! Looks good! I try to always add strawberries and lemons to my water but I will definitely be trying this soon! This looks so delicious! 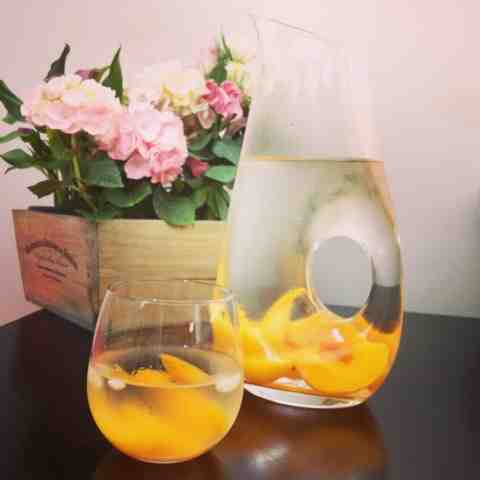 I usually add citrus fruits to my water, but I will definitely have to try peaches!! I'll be adding them to prechilled carbonated water and digging right in. I fell in love with the pitcher. Where did you get it from?